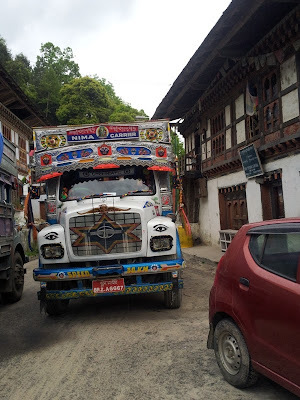 It was a fairly spur of the moment decision to take a taxi with Kyle to Trongsa for the last two days of our 6 day break. 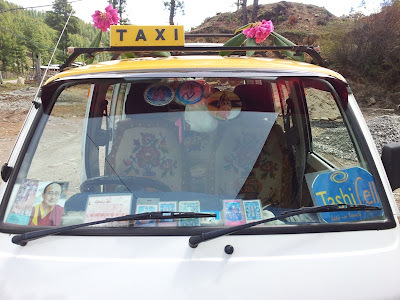 Taking a taxi was a good decision - we were able to leave home later and we could stop along the way to take photos as we liked. That's the type of taxi I like to travel in, pink rhododendrons and all! All along the way to Trongsa were magnificent pink and red rhododendrons. 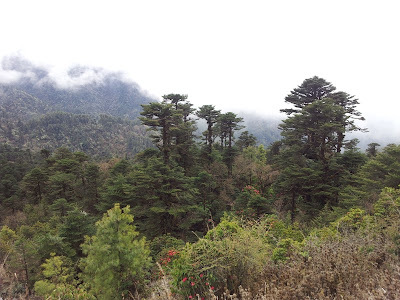 We stopped along the way near the pass between Trongsa and Bumthang to take photos in the clouds. This is the road! 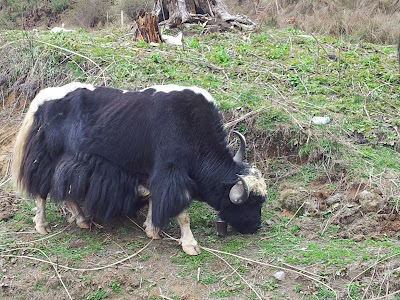 Y is for Yak in many alphabet books and now the boys have seen a real one! 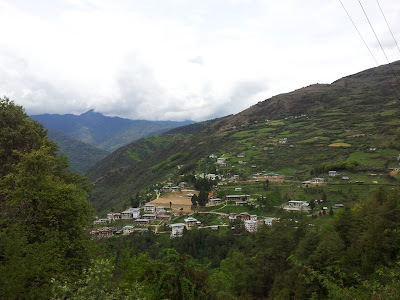 View of Trongsa including Kyle's school. 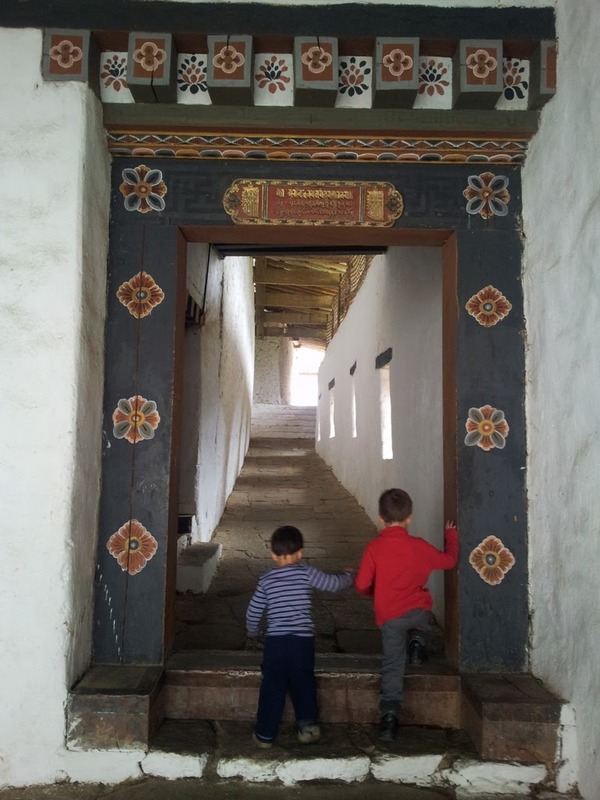 We all feel so refreshed and energised to continue on after our mini-break: seeing new things, enjoying interesting conversations with a variety of other people, tasting a different side of Bhutanese life and scenery and shedding the layers and enjoying some bright sunshine! 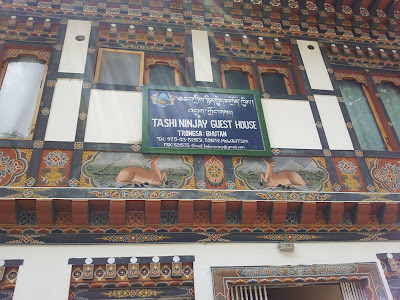 Kyle recommended the Tashi Ninjay Guest House (it had to be great with a name like that!) and we were not disappointed. 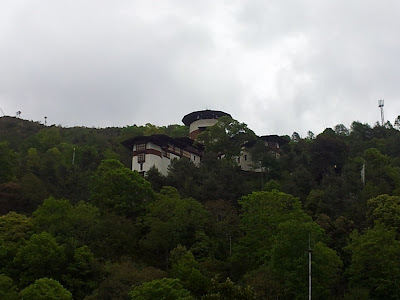 The view from our balcony was as good as any you would find anywhere in the world - a panoramic view of the amazing Trongsa Dzong - the largest in Bhutan, and all around steep mountains with Bhutanese homes clinging to the sides, and lush green in all directions. As the day passed the scenery changed from sun-soaked and tropical to being enveloped in moist fluffy clouds in the late afternoon. Fascinating and so different to Bumthang. 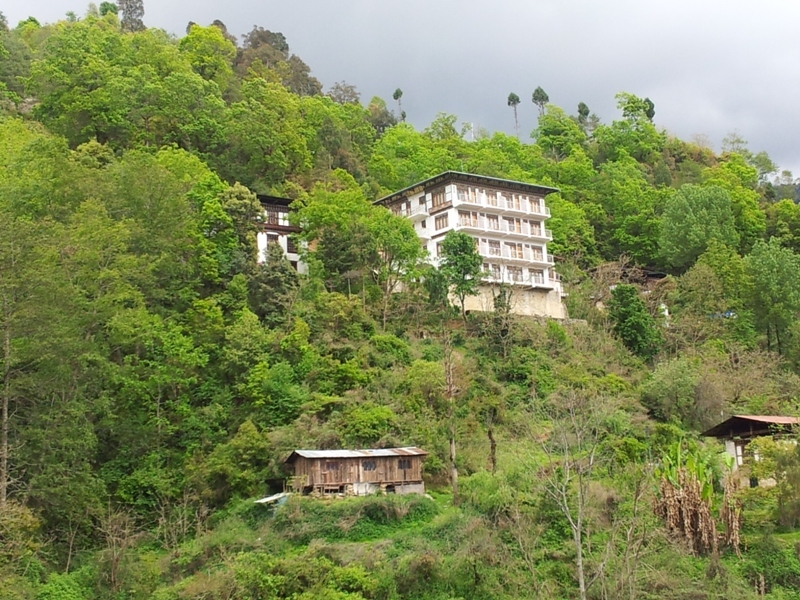 What an amazing view of the Dzong, the white and maroon colours perfectly complement the vivid greens and blue greys of the mountains. I can't get enough of these views! Being election day meant that all shops and restaurants were closed - not a bite to eat in sight. As we wandered down the main street Bob asked some girls where we might find some lunch and they invited us into their restaurant but asked us to be quiet as they were not meant to serve anyone, and definitely no alcohol was to be served. 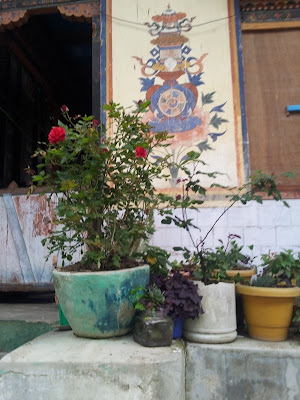 We had a delicious lunch of puri (fried flat bread), kewa-datsi (potatoes, chilli and cheese), and ginger-infused dal. The more chilli the better - my mouth was on fire, but it felt great! We continued down the road to the Dzong, and I took so many pictures on the way. 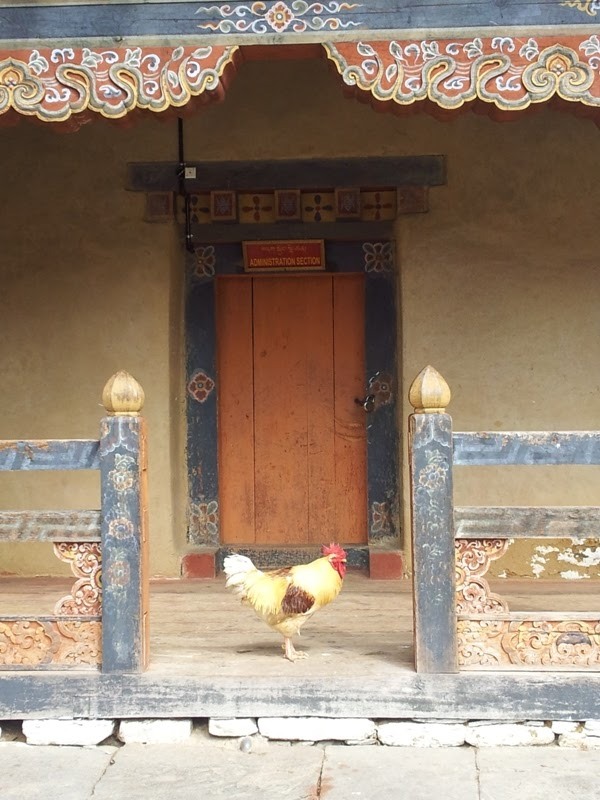 It is amazing that only one and a half hours down the road, the sights, sounds, smells and even tastes in Trongsa are so different to our region of Bhutan! I could definitely sense a stronger connection to India - in fact Trongsa reminded me so much of towns like Dharamsala or Shimla in Himachal Pradesh - roads built along the hillsides, with steep stairs connecting them, drains running down the roads smelling of.... 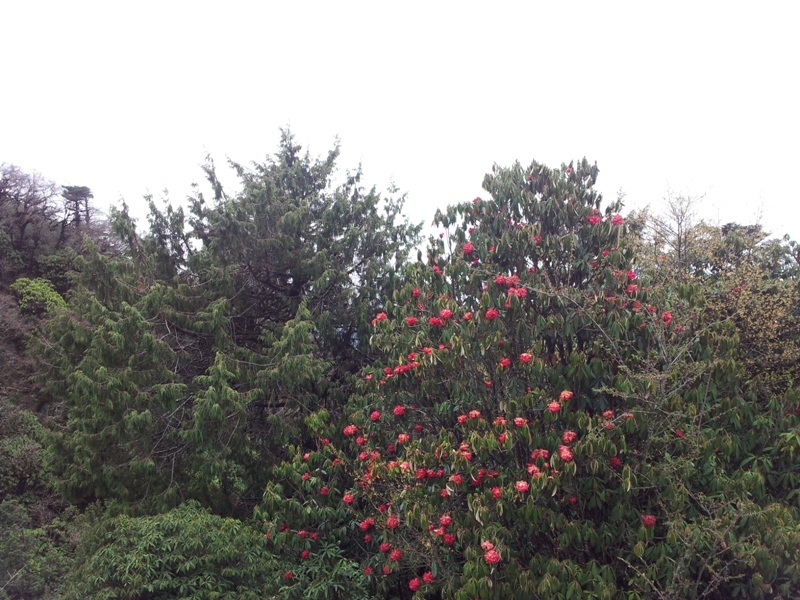 I don't know what - but the smell reminded me of India! 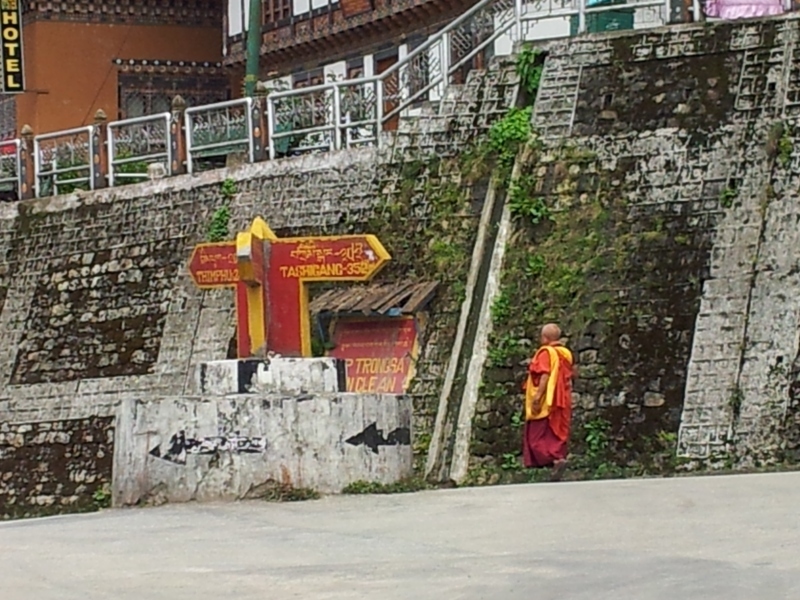 Even wafts of Indian rather than Bhutanese incense came from shops as we walked past. 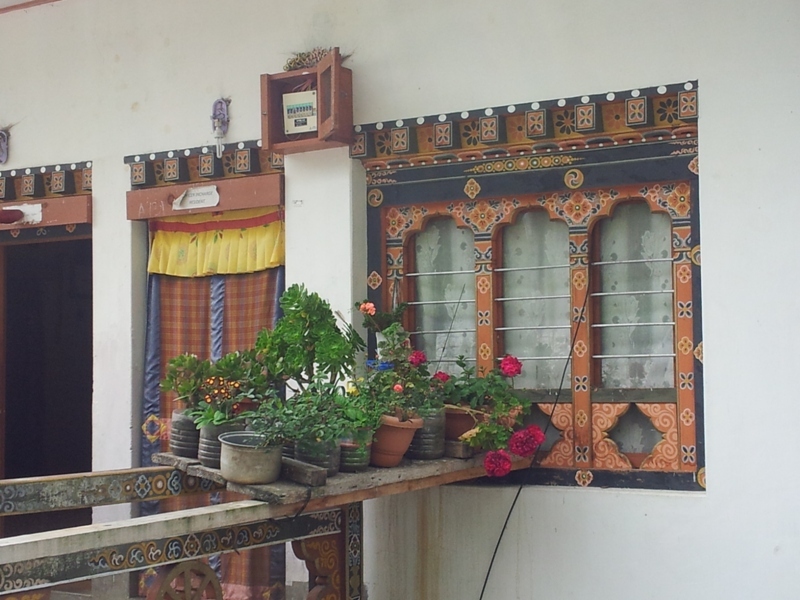 Where in Bumthang almost all women wear kiras in traditional designs, in Trongsa I saw interesting kiras in floral patterns on synthetic fabric – and a lot more people wearing trendy western dress or a combination of the two – a kira worn with a t-shirt and denim jacket – something I’ve never seen here! 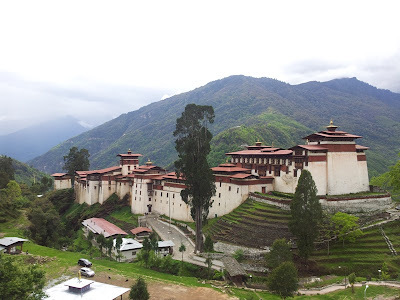 The Dzong, which stands on the site where a temple was built in 1543 and has been renovated and extended by successive leaders since then, was quiet and mostly deserted as it was a public holiday – only small groups of tourists were inside the vast complex. Without a guide, we wandered through the maze of corridors that opened out to courtyards, and climbed steep ladders to the next level and higher and higher, to more long dark corridors, that led to more dark corridors! Narrow alcoves with window slits that hinted of the Dzong’s past as a fortress for the region were perfect for sitting in and watching the antics of scores of monkeys who nimbly shimmied down wires and pipes and jumped across to window ledges to make their way from the roof of the Dzong down many storeys to the green grass and clover below. Remy and I watched in near silence for a good half hour before Xavier joined us and made so much noise that the monkeys noticed us and paused, eyeing us briefly, before being scared off! Striking a pose on the bridge to the Dzong. 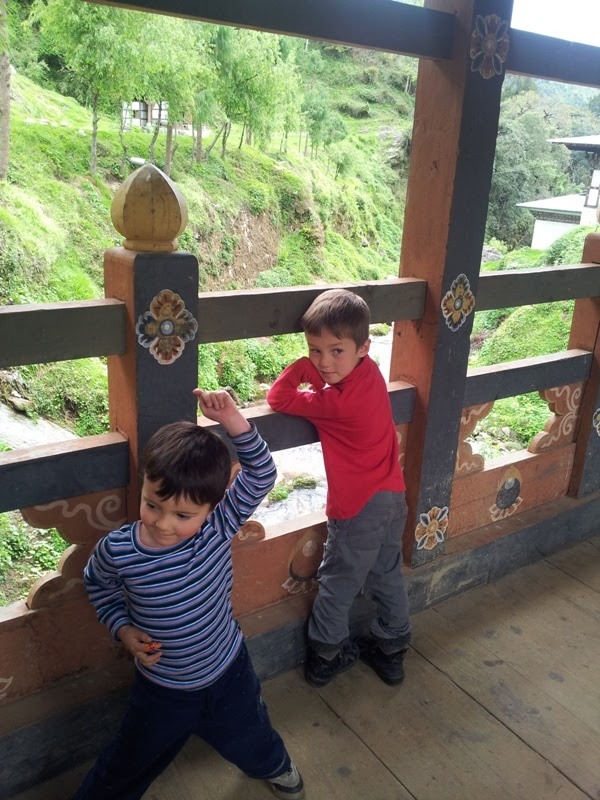 A sweet photo of the two little brothers. Windows were at a good height for little explorers. 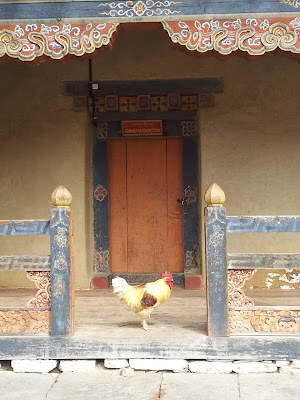 This rooster was crowing loudly in the empty courtyard. 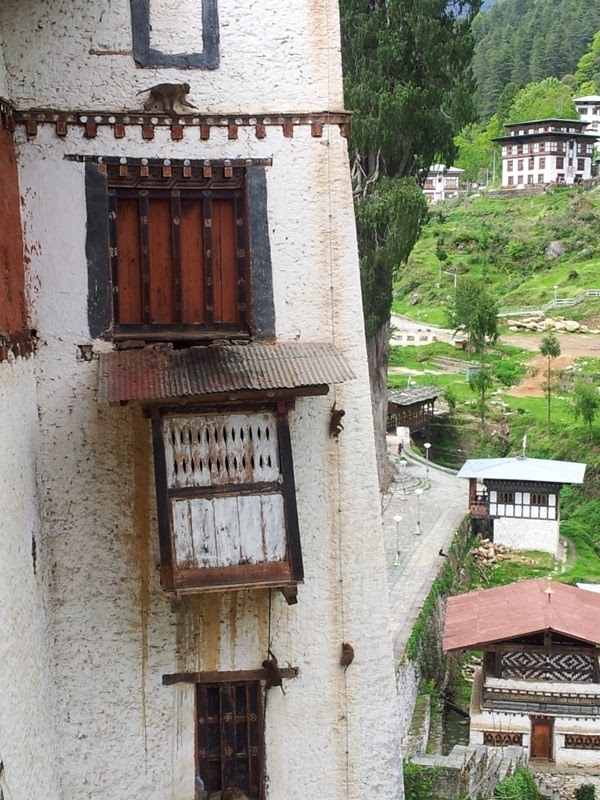 View up to our hotel from the Dzong. 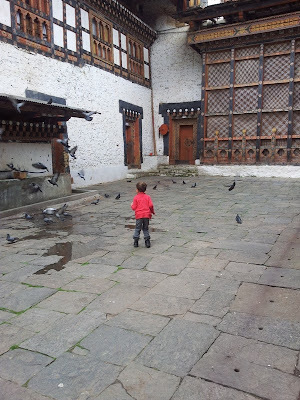 The boys had fun in this large courtyard chasing the pigeons. View up to the Tower of Trongsa Museum from the Dzong. 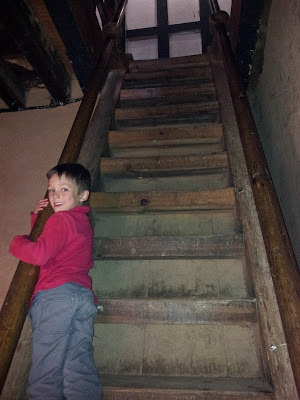 Climbing the steep ladders was fun! 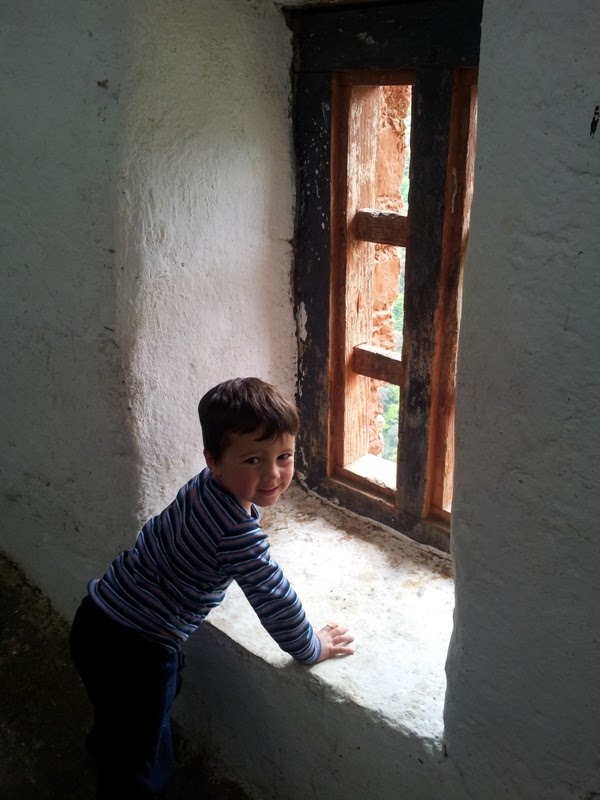 My favourite photo of the day - we loved watching the antics of the monkeys. 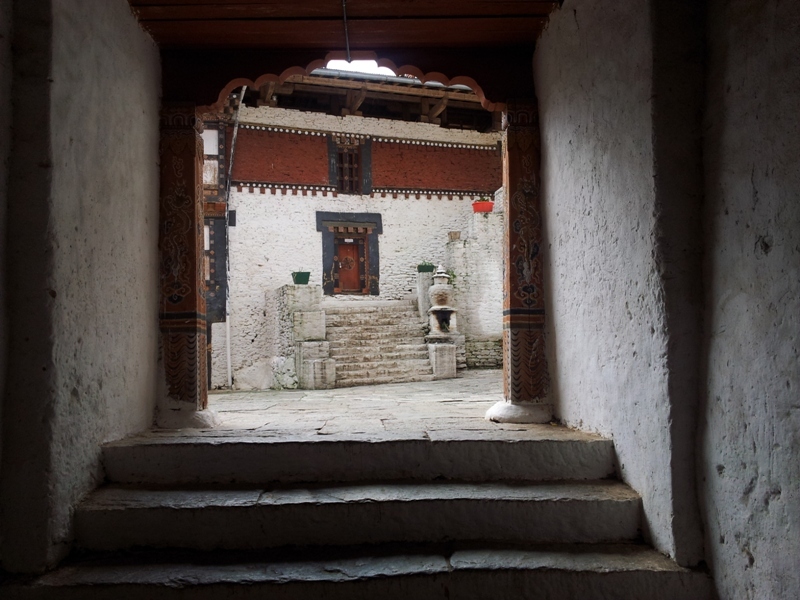 Most of the temples within the Dzong were locked so we peeked through windows to see inside. When we had nearly seen all there was to see, I noticed a familiar face among a small group of foreigners. 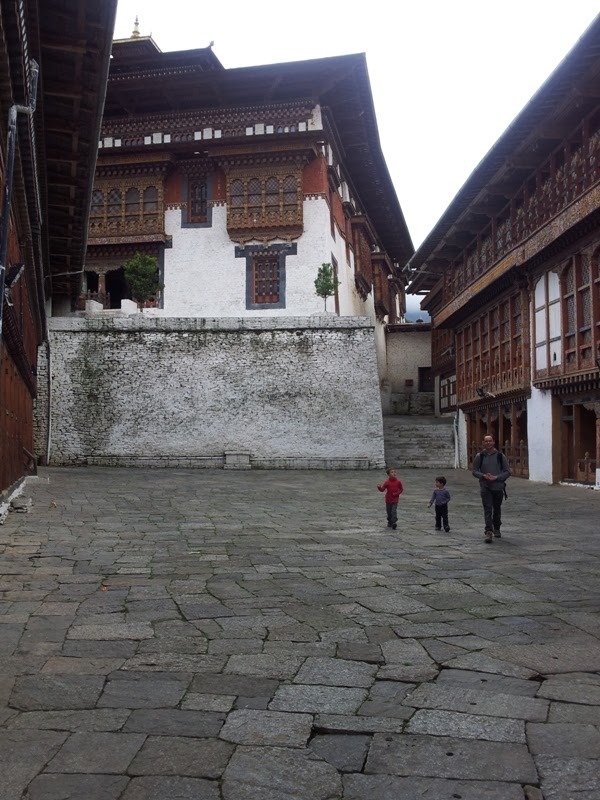 It turned out to be that of a man we had been introduced to in Thimphu – Michael Rutland – an English science teacher who has lived in Bhutan on and off for the past 40 years and has done so much for and with this country in this time. 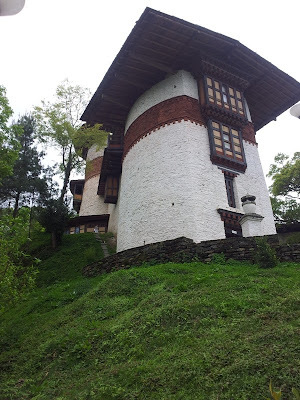 We chatted with him and his friends who are visiting Bhutan as his guests, and he brought up the idea again of us appearing in one of his television shows that he produces here in Bhutan – our chance for our 15 minutes of fame!! In Thimphu he was keen to recruit teachers as guest presenters for his show that demonstrates a physics concept by using real life Bhutanese examples. 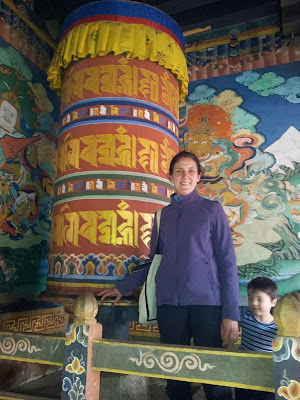 Physics not being my strong point, I didn’t think I was up to this challenge, even though I’d love to make it onto Bhutanese TV!!! But as it turns out I might have an opportunity to be involved in a show where I could read a children's story or two. That sounds like me! 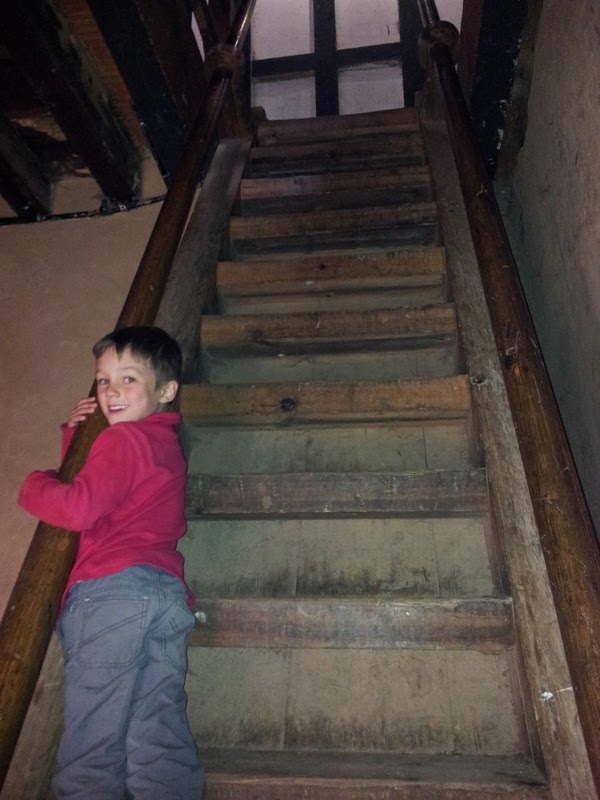 Xavier and I took the direct approach to get back to the hotel and walked straight back up the hill up hundreds of stairs (Xavier counting every one!) to get stuck into the other great asset of the Tashi Ninjay – free wifi – the first we’ve had in months. Let’s just say our ipad has quite a few more apps than it did this time last week! 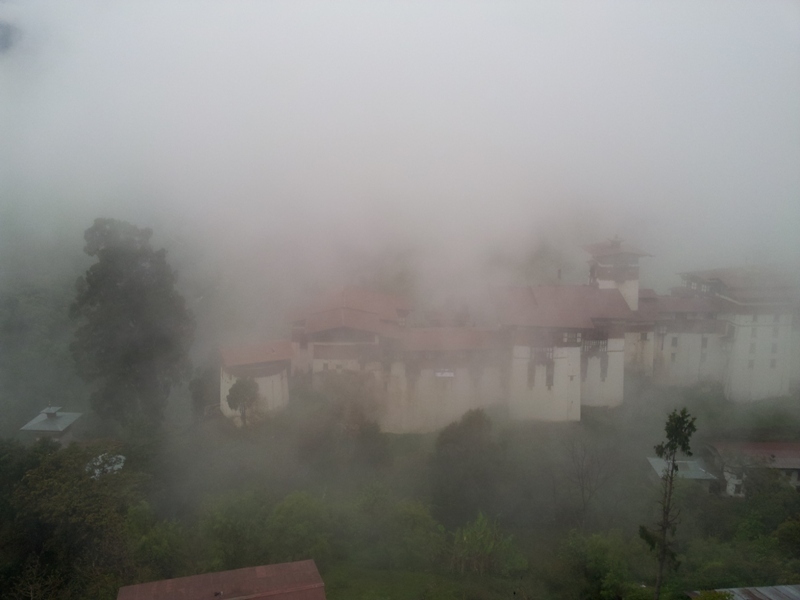 As we were getting ready for dinner, I looked out the window and was amazed at the difference in the view - the clouds had rolled in and eventually totally obscured the Dzong. We ate dinner at the hotel – and I love how dinner is ordered here. The restaurant doesn’t offer a menu, but instead gave us a blank sheet of paper and pen and asked us to write what we’d like! 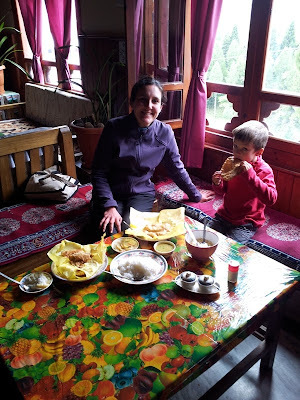 Now there are some things I would love to have ordered, but there is an unspoken understanding that we choose from the narrow range of familiar Bhutanese dishes that all restaurants serve. In the end we had a vegetable curry, kewa-datsi, red rice, dal, potato chips for the boys and some very nice sweet fried bread. On Wednesday morning our main mission was to visit the Tower of Trongsa – a museum that has been built in the original tower that overlooked and protected Trongsa.The museum which has been established with the help of a team from Austria, was very impressive – an amazingly beautiful building with fascinating architecture housing priceless relics from the Dzong, a cinema where a movie explaining the basics of Bhutanese history was shown, and from the very top of the tower, the most amazing views of Trongsa town and all the way down the valleys. 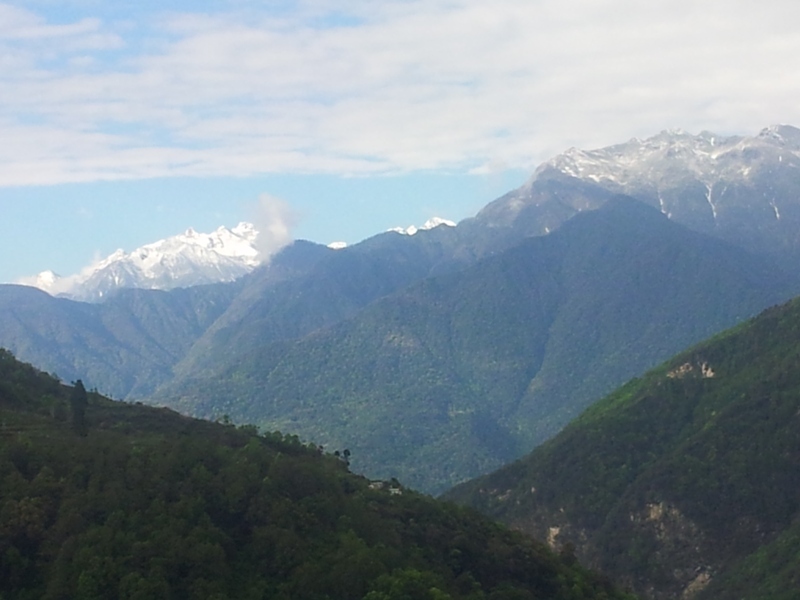 This is the type of view I love to wake up to! 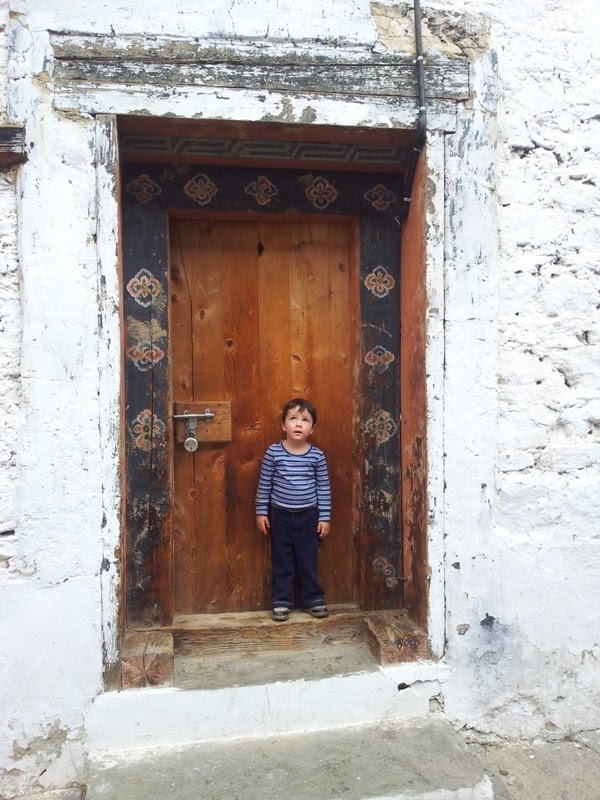 We walked back down to Trongsa and browsed in the shops. 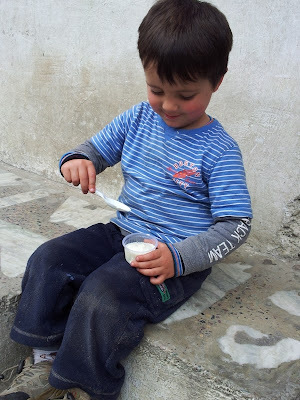 I had promised the boys an icecream if we could find one, which meant poking our heads through the door of a lot of general shops before finally finding one with a freezer. 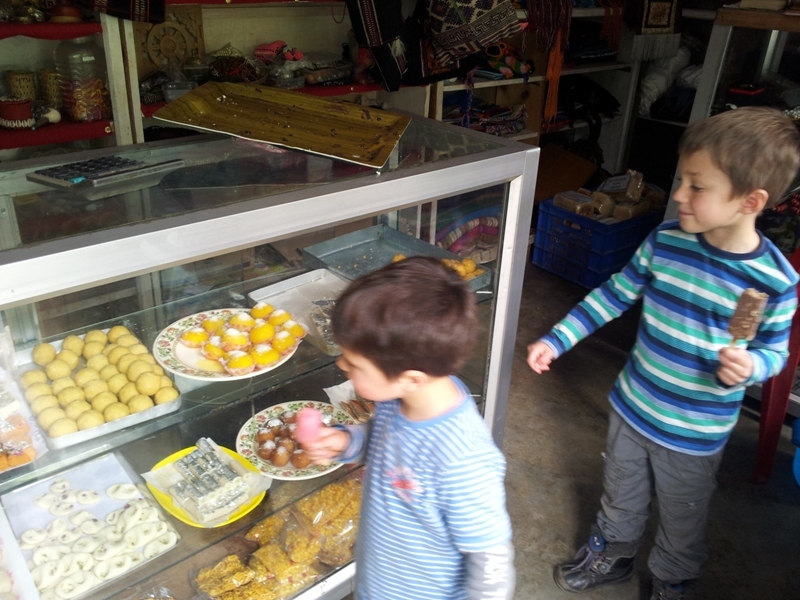 It turned out that shop was the local bakery with western style cakes but more exciting for me, a good range of Indian sweets. My eyes lit up and mouth watered to see these little sweets that I had enjoyed sampling years ago in India. I chose a selection: coconut burfi, gulab jamun, rasmalai with rose petals on the top and coconut burfi decorated with silver leaf – and they were packaged up in a little cardboard box. We sat on the front steps of the shop to eat our treats. This is what a holiday is all about!!! 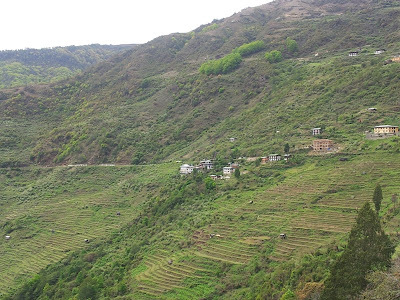 Remy and I wandered down to the vegetable market to see if we could find anything interesting that is not available locally – I bought a kilogram of fresh peas, but everything else we can get in Chamkar. I popped into an Indian general shop, to see if I could find any of the Indian ingredients that I miss, and surprisingly she had a big box of beetroot. I bought a kilogram of these too, dreaming of roasted beetroot for dinner and experimenting with a beetroot curry, South Indian style. By now it was time for lunch (it sounds like all we did was eat!!) 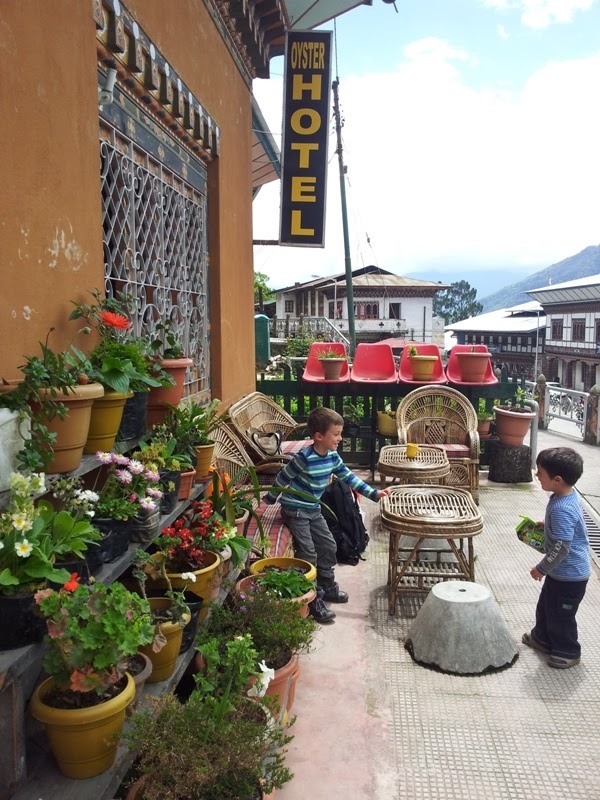 and we climbed the stairs to the most famous restaurant and meeting place in Trongsa – The Oyster Hotel. Inside was packed with well-dressed Bhutanese and Indian tourists so we sat on a wicker lounge outside in the sun – enjoying amazing views of Trongsa and the hills and mountains beyond. I had shuma datsi with rice, Bob tried a meat Thukpa (Tibetan noodle soup) and the boys had Indian-style fried rice. We soaked up the sun and filled in time reading our just-purchased magazines and playing new games on the iPad. Somehow the wires had got crossed though – we were told the bus going through to Bumthang would pass by between 3 and 3.30pm so we went to wait by the side of the road to hail it down. Unfortunately after an hour of waiting we came to realise it probably went through half an hour earlier, although we heard it was full so we wouldn’t have got a seat anyway. 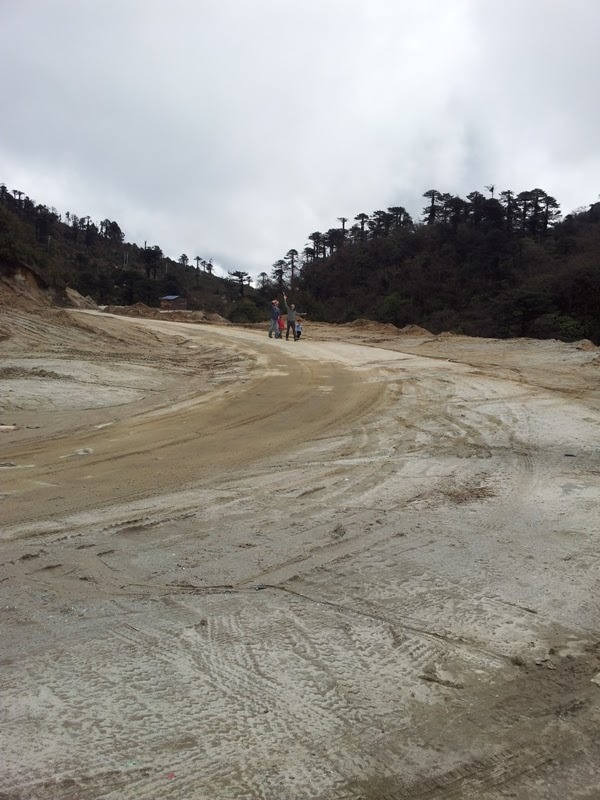 Instead we arranged a taxi which flew through the mountains and delivered us back in Chumey in the record time of one hour and fifteen minutes – back home to our pine trees, cold weather, wood fires and school tomorrow!